Dragos was kind enough to allow to people like me, with no time and skills to create their own website, to attach photos. 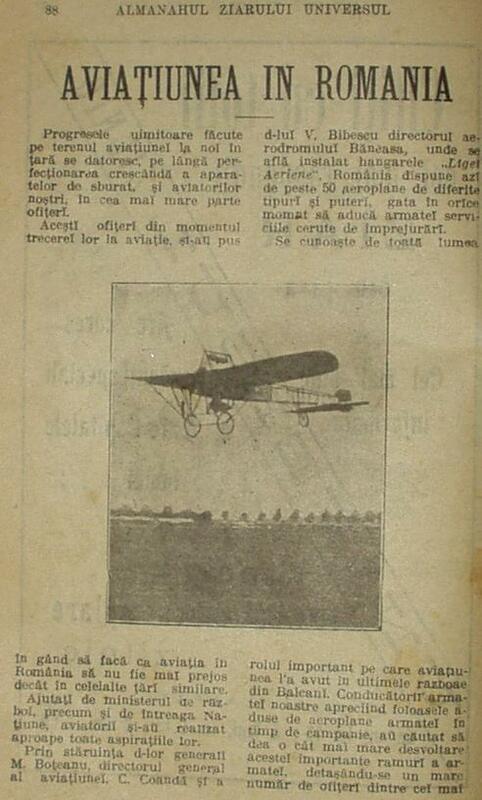 I am starting this topic with images from the very beginnings of the Romanian aviation, the days when most of your grandfathers and grandmothers were not born yet. The amazing progresses performed in the aviation field in our country are due, in addition to the continuous improvement of the flying machines, also to our aviators, most of them officers. These officers from the moment of their transfer to aviation, set their mind to make aviation in Romania as good as it is in the other countries. Helped by the Minister of War, and also by the whole nation, the aviators succeeded in almost all their aspirations. 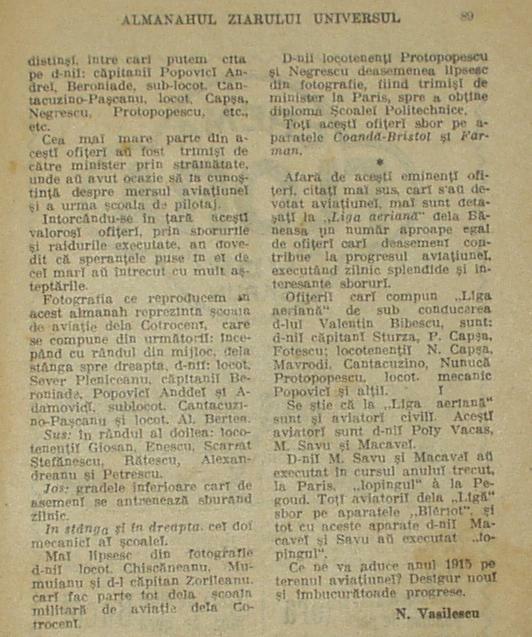 Through the perseverance of Mr. General M. Boteanu, the general director of aviation, C. Coanda and of Mr. V. Bibescu - director of Baneasa Aerodrome, where is the location of the hangars of the "Aerial League", Romania owns today more than 50 airplanes of various types and power, ready any time to help the army with services as required. ...refined quality. From them we can mention the following gentlemen: Captains Popovici Andrei and Beroniade, Sub-Lieutenant Cantacuzino-Pascanu, Lieutenants Capsa, Negrescu, Protopopescu, etc., etc. Most of these officers were sent abroad by the Ministry, where they had the chance to take notice about the evolution of aviation and to follow the school for pilots. Turning back home, these valuable officers, through their flights and raids performed, proved that they exceeded by far the the hopes the leaders put in them. 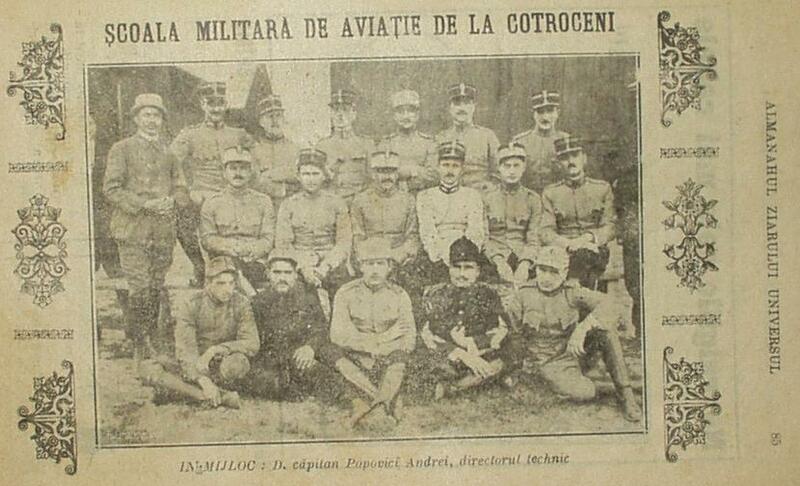 The photo we reproduce in this almanac present the aviation school from Cotroceni, composed from the following: starting with the middle row, from left to right, the following gentlemen: Lieutenant Sever Pleniceanu, Captains Beroniade, Popovici Andrei and Adamovici, Sub- Lieutenant Cantacuzino-Pascanu and Lieutenant Al. Bertea. 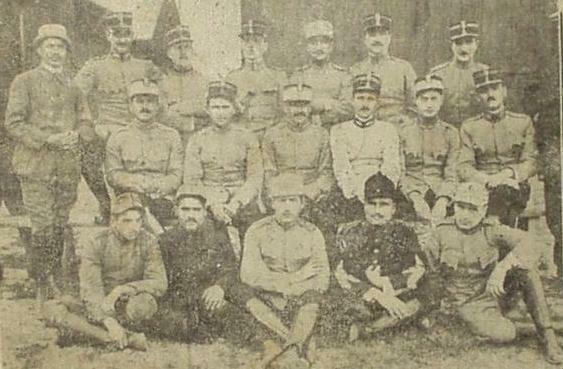 Above - in the second row: Lieutenant Giosan, Enescu, Scarlat Stefanescu, Ratescu, Alexandreanu and Petrescu. Below: The inferior ranks who also are training themselves by daily flights. In the left and in the right: the two mechanics of the school. From the photo are missing Lieutenant Chiscaneanu, Mumuianu and Mr. Captain Zorileanu, who also belong to the military aviation school from Cotroceni. Mr. Lieutenants Protopopescu and Negrescu are also missing from photo, being sent by the Ministry to Paris, to get the diploma from the Polytechnic School. All these officers are flying on planes Coanda-Bristol and Farman. In addition to these excellent officers, mentioned above, there are also sent to the "Aerial League" from Baneasa a number almost equal of other officers who also contribute to the progress of aviation, proceeding daily splendid and interesting flights. The officers who compose the "Aerial League" under the leadership of Mr. Valentin Bibescu, are: Captains Sturza, P. Capsa, Fotescu; Lieutenants N. Capsa, Mavrodi, Cantacuzino, Nunuca Protopopescu, Mechanical Lieutenant Popovici and others. It is known that in the "Aerial League" there are also civilian aviators. These aviators are Mr. Poly Vacas, M. Savu and Macavei. Mr. Savu and Macavei performed last year, at Paris, the "looping a la Pegoud". All aviators of the "League" are flying on "Bleriot" airplanes, and also with these planes Mr. Macavei and Savu performed the "looping". What will bring to us the year 1915 in the field of aviation? Of course new and gladdening progress. General C. Coanda (Constantin Coanda - mentioned in the second page shown here from the almanac) was the father of Henri Coanda. When he was only 26 years old, Henri Coanda designed, built and tested in flight the first plane with turbojet in history - in 1910. This was 30 years before the Germans and the British. I wrote this because I know not only the Romanians are reading this forum. One of the men in this photo is Panait Pana, the uncle of my grandfather. 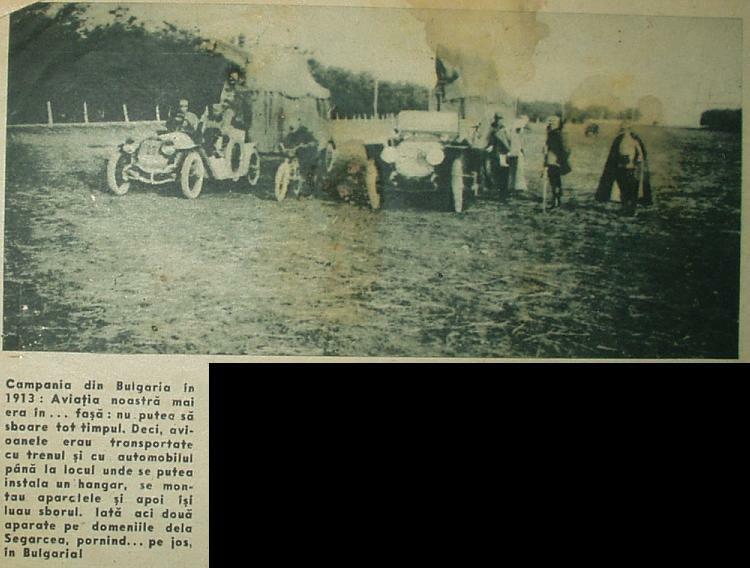 The airfield was at Boboc (today, in Buzau county), and my grandfather, as child, was visiting it with his uncle. That's why my grandfather entered later in aviation, but he left it after his 2 best friends died in crushes in the same week. One of them burned beyond recognition - his carbonized body shrinking to the size of a puppy dog, to use the words of my grandfather. Translation from another page of "The Almanac of The Universe Newspaper", issued at the end of 1914. Mr. Captain BERONIADE beat the record of altitude in Romania, reaching 4200 m.
Mr. Captain POPOVICI ANDREI, director of the School of Aviation from Cotroceni. Mr. Sub-Lieut. 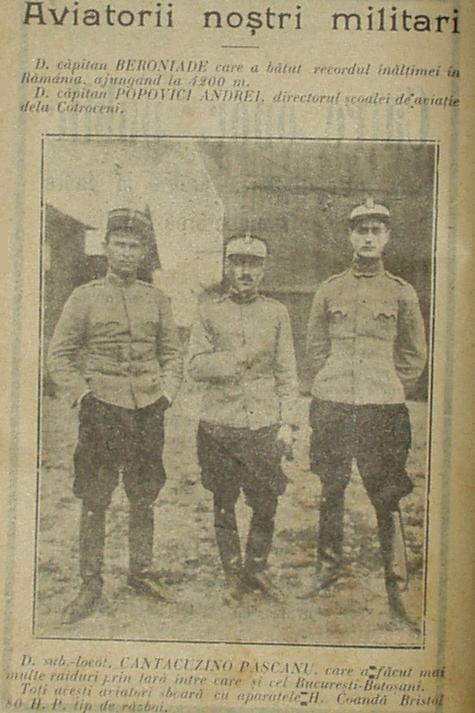 CANTACUZINO PASCANU, who performed several raids across the country, one of them being between Bucuresti-Botosani. All these aviators are flying with airplanes H. Coanda Bristol , 80 HP, the military version. In the following very rare photo, the whole Romanian dynasty (excepting Mihai, not born yet) is shown on a bridge built across Danube at Nicopole. The photography was taken by a Romanian aviator in 1913, when Romania entered in The Second Balkan War and used a little fleet of airplanes during campaign. Left: King Carol the First. Middle: the future King Carol the Second (still a teenager in the photo). Right: the future King Ferdinand. I edited one of my posts. I deleted from there the following: Number "4" from "4200" is arguable. It is my interpretation of the print. Technically it was possible by the end of 1914. The number can be also "1200"
Now I have no doubts. Just look in the attached comparison, both images being taken from the originals shown under this topic. So that was really a "4". Meaning Mr. Captain Beroniade really reached 4200 m in altitude, sometimes in 1914. Which technically was possible - you just have to look at the ceiling of the British plane SOPWITH TABLOID, shown by me right here under this topic. 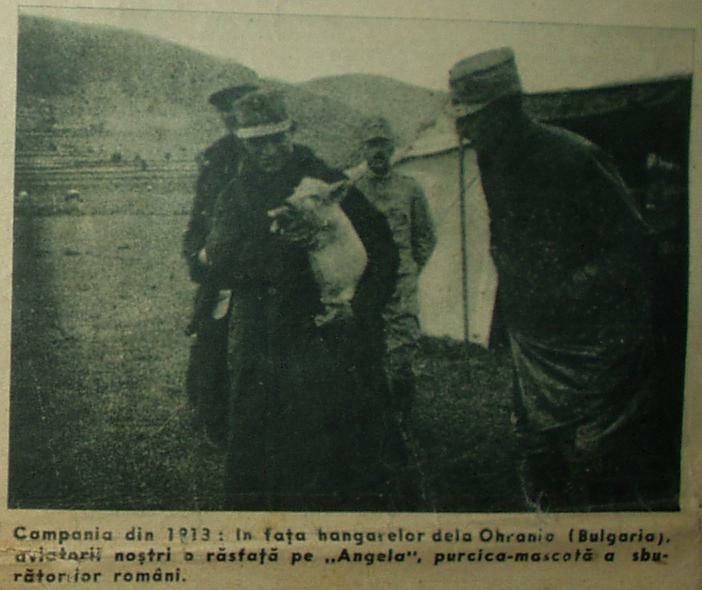 The campaign of 1913: In front of the hangars from Ohrania (Bulgaria), our aviators pamper "Angela", a baby sow, the mascot of the Romanian aviators. 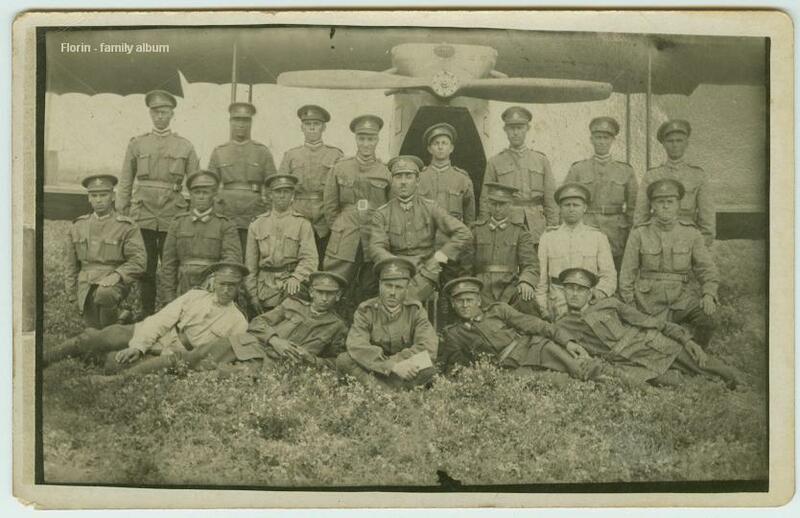 The campaign in Bulgaria during 1913: Our aviation was still... in swaddling clothes: it could not fly all the time. Thus the airplanes were carried by train and by automobiles to the place where a hangar could be built. There the airplanes were assembled, and after that they could take off. Here are shown two airplanes on the estates of Segarcea, starting... on ground, in Bulgaria! Just wanted to say, nice pictures and interesting posts, Florin. Thanks for taking the time to post them. 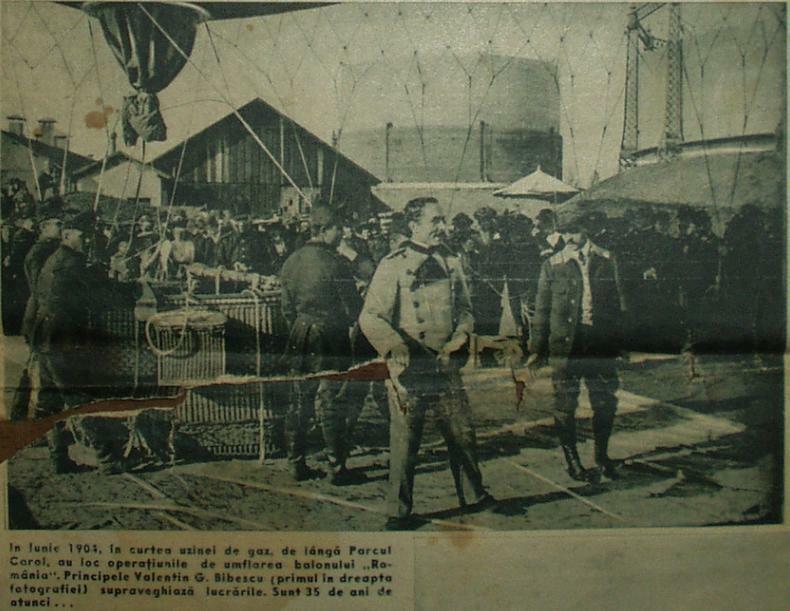 In 1906, in Carol Park, with the occasion of the jubilee exhibition occurred 33 years ago, the balloon "Romania", piloted by Prince Valentin G. Bibescu, is lifting. The crowd, curious and thrilled, admire "the wonder". I clipped together the photos and the text, because they are dedicated to the same person. They are from the same "Illustrated Reality" used for some previous posts. 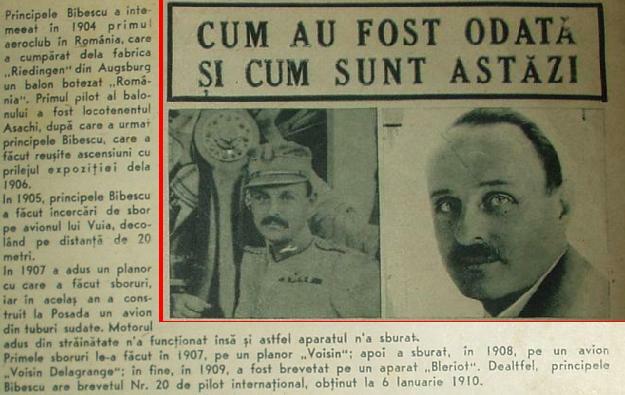 The 2 photos shown here are at the top of a column of portraits with various personalities with links to the early Romanian aviation. The title above the column of portraits is: "HOW DID THEY LOOK ONCE UPON A TIME AND HOW DO THEY LOOK TODAY". As of June 1939, the date of printing this "Illustrated Reality", Prince Valentin Bibescu was the president of the International Aeronautical Federation. Needless to add, the right photo is the one showing Mr. Bibescu as he was in 1939, and the left in his earlier years. And now the text, giving more insight about the balloon shown in my previous 2 posts. Prince Bibescu founded in 1904 the first flying club in Romania, which purchased from the "Riedingen" factory, located in Augsburg, a balloon named "Romania". 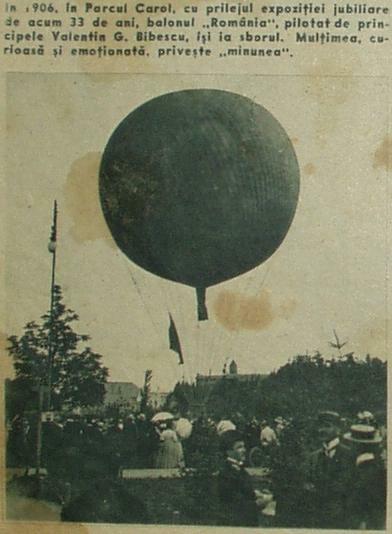 The first pilot of the balloon was Lieutenant Asachi, followed by Prince Bibescu, who made successful ascents with the occasion of the 1906 exhibition. In 1905, Prince Bibescu made flight attempts with Vuia's airplane, taking off along a distance of 20 meters. In 1907 he brought a glider with whom he made flights. In the same year he built at Posada an airplane made by welded pipes. But the motor brought from abroad did not function, thus the airplane did not fly. He did the first flights in 1907, in a "Voisin" glider; then he flew in 1908 in a "Voisin Delagrange" airplane. Finally, in 1909, he took his license with a "Bleriot" airplane. Prince Bibescu has the license No. 20 as international pilot, obtained at 6th of January, 1910.